China’s slowing economy, especially its weakening export sector, has framed the recent wave of labor protests in the manufacturing sector. Seven years after the Great Financial Crisis, China has been dealing with unstable export market in the North America and Europe. While the government puts the economic growth rate at a steady 7 per cent, there are visible signs of economic distress reflected in declining industrial activities. And there is no easy fix. In fact, the government has hoped to upgrade manufacturing, and to some degree turned a blind eye to the decline of low-tech export processing. This development is contributing to a long-term trend of manufacturing capital relocation both within industrial regions and from the southern coast to the interior–if not to Southeast Asia. As a result of rising wages and labor unrest, especially over the last decade, some factories simply closed down. The immediate result is an upsurge of strikes and militant protests in the last couple of years where companies try to avoid any compensation for closure or relocation. Workers ask for severance payment and compensation for years, sometimes decades, of unpaid social insurance and housing fund contributions to which they’re legally entitled. For most of the last three decades, social insurance and housing fund contributions hadn’t been among the main concerns of Chinese workers. But a combination of workers getting older and demanding a fair share of their contribution has placed these demands at the center of recent strikes. I focused on one such strike in a previous article: hundreds of migrant workers at the Lide Footwear Company went on strike in late 2014 after hearing rumors about relocation. Many were unwilling to relocate with the company, and were instead hoping to receive severance payment and other compensations. China’s labor laws stipulate a range of such compensations, but the lack of enforcement means that management gets to dictate what workers receive–or not. In this case, the management’s refusal to negotiate fairly led to a number of strikes and negotiations between workers and management over many months. The Lide strike stands out. While most strikes end in a matter of days and rarely last for more than a couple of weeks, it was not until mid-2015 that the Lide workers were finally able to win most of their demands from management. Over the same period, another strike similar to Lide in many ways drew media coverage following a solidarity campaign highlighting the company’s role as a contractor for the Japanese clothing retailer Uniqlo, a popular brand with over 400 stores in China. The Shenzhen Artigas Clothing and Leather Company, known locally as Qingsheng, was established in 1992 with Hong Kong investment shortly after Deng Xiaoping accelerated China’s opening to foreign direct investment, and has been oriented primarily to export. In 2014, it made plans to relocate to another industrial park without any prior consultation or negotiation with workers, sparking initially a nine-day strike in December which was forcibly suppressed by the police. On June 9 this year, as the company tried to shut down the factory and remove equipment, over 900 workers began a protest, occupying the shopfloor to prevent management from closing down the factory. They demanded negotiation on severance payment and compensation. Unpaid social insurance, in particular, has become a significant issue in such strikes, as many workers have worked at the same factory for more than a decade. Some workers then went on hunger strike to try to put more pressure on management. Heavy-handed tactics were used against workers, including harassment and detention of strikers by the local police. Only after three weeks of persistent factory occupation did management finally agree to start negotiation. However, it refused to hold collective negotiation and only wanted to deal with workers on an individual basis. Workers rejected the management’s attempt to divide workers, and continued the strike. 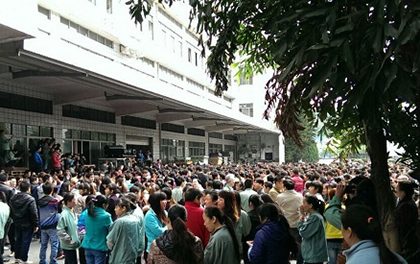 As the strike entered into deadlock, some 200 workers travelled to Guangzhou and staged a regular protest at the Guangdong Provincial Government. After days of protesting and sleeping in a nearby park, they were forcefully removed and briefly detained by police. Management also stepped up pressure on the remaining workers occupying the factory by cutting off utilities. Workers were locked out of the factory, and the lockout was enforced with the assistance of local police. In contrast to the Lide Footwear factory strike which won most of workers’ demands, the Qingsheng strike ended without any success to force management into negotiation. These two cases, and other similar strikes in recent months, reflect the deleterious impact of slowing export sector on manufacturing workers. Companies operating on thin profit margins have opted to relocate, scale down production, cut the number of their workers, and ask workers to re-sign their contracts. In the face of such assaults on their jobs and livelihood, workers’ protests have taken the more radical form of repeated work stoppages, factory occupation and collective negotiations with management over several months. Not all strikes end in success. In fact, there is evidence that police have stepped up crackdowns on high-profile strikes. The key feature of these strikes is the development of sustained mobilization and disciplined organization over a long period of time. Workers have to build ad-hoc and informal organization with elected representatives from scratch, and sustain it over months while maintaining the confidence of fellow workers. And as workers are unprotected in their industrial actions by law, the longer the strike lasts the riskier it will become for the strike leaders. The assistance of Chinese labor NGOs no doubt lends experience and legal knowledge to the organizers. But the striking workers themselves, rather than any outside influence, remain the driving force of these strikes. As management and local police force work together to coerce workers back to work, their mobilization and solidarity have proven crucial in resistance. Key to the mobilization is a strong sense of entitlement for having worked so many years at the same company, which gives workers a firm moral and legal reason and determination to take actions. During these strikes, it is common for workers to highlight the fact that the company has taken the fruits of their labor, and thereby frame their action as one of both legal and moral entitlement. In addition, the fact that many workers are either facing contract termination, or willing to quit, might have contributed to their determination to take the risks. And as industrial employment remains plentiful, workers will not have too much problem finding jobs elsewhere. Strikes related to factory relocation and closure are likely to dominate the manufacturing sector in the next few months. This development poses a broader question about the development of China’s working class movement. Studies of Chinese workers’ collective actions argue that in the last decade or so, as workers become more aware of their rights and collective strength, the migrant working class movement has transitioned from a primarily defensive movement against wage arrears to an offensive movement, demanding rising wages and in some cases democratization of workplace unions usually dominated by management. While this formulation is necessarily a generalisation–in fact, demanding unpaid wages still constitutes the main reason behind the largest number of labor protests today–it is useful in capturing an important trend in the movement. So does the recent upsurge of strikes related to severance payment and compensation suggest a shift away from offensive back to defensive struggles? Or is this rather a brief interruption to the long-term trend as described? Will the confidence of workers to fight for higher wages be rolled back as they are forced to face the reality of manufacturing decline and settle for severance payment as the best they can achieve? Will the working class militancy that has been building up in the last two decade be lost as the slowing economy closes off space for offensive struggles, and as the state heightens suppression? There is cause for pessimism, but also for optimism. That workers make demands on unpaid social insurance and housing contribution legally due to them is in fact as important as their struggles for higher wages. Given that employer social insurance and housing contributions have long been enshrined in the labor laws, actually demanding them is an important step forward. It is true that migrant workers have been reluctant to demand social insurance because they also have to make a contribution out of their meager wages, and do not know for certain whether they will benefit in old age. But as many are near retirement age, this is becoming a more urgent issue for them. Moreover, workers have raised paid maternity leave and high-temperature allowance among others as part of their demands. While these tend to be ignored by management in negotiations, it reflects workers’ greater awareness of labor rights and entitlements. These legal entitlements enable workers to skilfully and tactically deploy the law in their negotiation with management. There is another reason that it would not do justice to these strikes to characterize them as defensive. It is no easier to fight for these demands than for higher wages, and it is offensive in expanding the basket of demands that could be negotiated with management. It may well be much harder in most cases, because a lump sum payment of severance payment and social insurance and housing contribution can easily reach millions and sometimes tens of millions of Yuan. In addition, these strikes also train workers in mobilization and democratic representation and deliberation, as well as negotiation and bargaining–the same experience developed during offensive strikes. This is not to ignore that tougher economic conditions may pose more challenges to the workers’ movement. It will be naïve to think that any labor movement would follow a linear progression. The fact that China’s working class movement has seen intensifying collective actions over the last two decades, in particular since the Honda auto workers’ strike in 2010 which is widely seen as pointing to the maturing of the labor movement, may have contributed to such a perhaps overly optimistic, linear view. In practice, workers’ organizing capacity and consciousness have always been geographically and sectorally uneven. Manufacturing strikes have been concentrated in two regions: the Yangtze River Delta and Pearl River Delta. The present situation facing manufacturing workers similarly should not be generalized to the working class movement as a whole where non-manufacturing and service sectors have also been more active. The slowing of the export sector is likely to continue, and the government sees the shift away from export-dependency as essential to rebalancing China’s economy. The resulting capital relocation and restructuring in the manufacturing industry will likely erode some of workers’ hard-fought gains, at least temporarily. This will displace workers, and may also disorganize and fragment the nascent labor movement to some extent. New struggles and networks both in the old and new places will take time to develop. But this is an unavoidable and necessary learning experience for a still young labor movement. Workers’ current organising and mobilizing experience in these strikes may well be invaluable for their future struggles. Kevin Lin is a PhD student in Australia researching labor politics in China. This article, slightly edited for publication here, appeared in the July-August 2015 issue of the Made in China newsletter.